More than 1,200 undergraduate and graduate students are expected to participate in the University of California, Merced’s 12th commencement ceremonies this weekend — its largest class since opening in September 2005 — bringing the university’s alumni total to nearly 8,000. UC Merced’s commencement participants hail from 42 counties in California, two other states and seven other countries — Chile, China, France, Germany, India, Mexico and Pakistan. They range in age from 20 to 61 years old. Jocelyne Fadiga, a chemical sciences major from Abidjan, Ivory Coast, will represent the Class of 2017 as the student speaker at Saturday’s ceremony. In her time at UC Merced, Fadiga served as a scholar in the Degree Attainment for Returning and Transfer Scholars program, the California Alliance for Minority Participation program and the Summer Cardio-Renal Undergraduate Research Experience program; a volunteer for Merced County Project 10%; and editor for the UC Merced Undergraduate Research Journal. Santa Cruz native Havilliah “Jake” Malsbury will represent the class at Sunday’s ceremony. Malsbury, a history major, served as an intern for the campus’s Civic Leadership program, editor-in-chief of the Undergraduate Historical Journal, a member of the Native American Tribe Conservation Project, and president of the Historical and Current Affairs Society. Two graduates will sing the national anthem: Carlos Nunez, a mechanical engineering major from Union City, at the Saturday ceremony; and Rebecca Henke, a cognitive science major from Merced, at the Sunday ceremony. HP Inc. Chief Diversity Officer Lesley Slaton Brown will speak to the candidates of the School of Engineering and School of Natural Sciences and their families at 9 a.m. May 13. Slaton Brown, a Merced native, has more than 20 years of experience in the technology industry. She is responsible for leading HP’s global diversity and inclusion strategy, programs, partnerships, reporting and operations. Award-winning journalist and author Héctor Tobar will address the candidates of the School of Social Sciences, Humanities and Arts and their families at 9 a.m. May 14. Tobar was part of the Los Angeles Times reporting team that earned a Pulitzer Prize for coverage of the 1992 Los Angeles riots. The number of graduates is not the only area where the campus is seeing growth. The 2016-17 academic year has produced a host of awards, accolades and milestones — including record numbers of student applications, breaking ground on an international award-winning expansion project and being named one of the best public universities in the nation by U.S. News & World Report for the very first time. 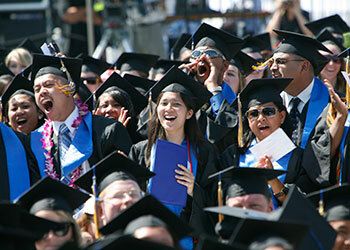 In its debut on the U.S. News rankings, UC Merced showed particular strength in graduation rates. According to the report’s model, the campus’s predicted 6-year graduation rate was 52 percent, but the actual rate was 66 percent. The 14-point difference ranked UC Merced No. 8 among 298 universities in that category.